Writing is an act of hope. It means carving order from chaos. That just about says it. All the sounds, smells, scenes, fragments of scenes, thoughts and surges of emotions must be pulled into order. As I begin a new book, the characters' faults and failures, their kindnesses and cruelties, the why's and how's of their actions, make my head spin. They're all a part of the heroine's struggle to overcome what she must, or die trying. Sitting down at the computer is an act of hope. Communicating the essence of the characters and their stories is always a challenge. Sometimes it's as much a struggle for me to write the story as it is for the character to live it out. Still, there's a joy in the struggle. Discovering, the struggle as well as the joy that comes with it, is something I crave. These characters won't leave me alone. 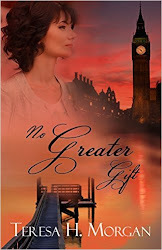 This book, tentatively titled No Greater Gift, has been a stretch for me. The plotline is more intricate than any I've attempted before, and the characters face more than choices between not just stark right and wrong. This is another book of my heart so, as Jacob wrestled with the angel, I keep wrestling with this book. One of my characters is trying to be mysterious. He probably thinks that because his mission in London during WWII is secret, that his deeper thoughts and emotions must be, too. Perhaps he's annoyed that tis isn't "his" story. He's got another think coming.